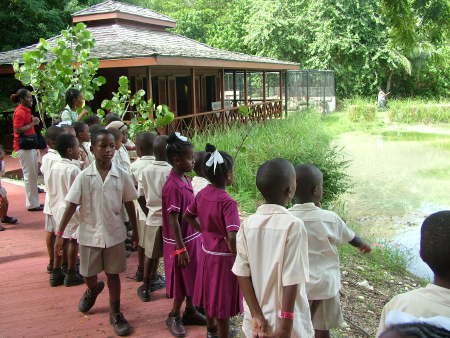 [Christ Church, BARBADOS] The new Barbados Children’s Environmental Action Awards (CEA) programme was announced today by the Graeme Hall Nature Sanctuary. To be awarded four times each year, the CEA Awards encourages and recognises children and children’s groups for their activities that directly preserve and protect terrestrial and marine natural habitats and parklands throughout Barbados for future generations. “Today’s children are tomorrow’s leaders. We encourage children to learn the importance of the environment to our health and social welfare, and be proactive in saving wild habitat and open spaces, as well as helping to identify and correct environmental problems,” said Peter Allard, Chairman of the Sanctuary. Each CEA Award includes a Bds. $2,000 prize, plus a public recognition ceremony at Graeme Hall Nature Sanctuary for invited children, families and guests. The first CEA Award nomination deadline for 2009-2010 is September 15, 2009. The successful nominee will be publicly announced by October 31, 2009. Barbados Government Asking Developers and Hotels To Keep People Employed – But What Of The 85 Jobs Lost At Graeme Hall Nature Sanctuary? As we at BFP have been saying for some time, this year is going to be a tough one – very tough. We’ve also said that each of us should look after our own family members and friends because government may be unable to do so. Plan for the worst, hope for the best is always wise. Minister Sealy has been asking the tourism industry and project developers to continue with their plans, especially considering that the developers have already received concessions and assistance from Barbados. I’m not a politician but it seems to me that this is where political skill comes into play. Politics is often referred to as “The art of the possible”, so let’s see if Minister Sealy can make things happen. Another place where Bajans can help each other is by accepting cutbacks in hours at work so that everyone remains employed to some degree. The Nation newspaper had an editorial mentioning this possibility a few days ago. That option may upset some folks, but the alternative might be even more upsetting. What About Graeme Hall Nature Sanctuary? Unfortunately, developers and their politician friends in both the DLP and BLP want to develop the primarily government-owned lands around the sanctuary and they have fought tooth and nail to prevent the establishment of the proposed Graeme Hall National Park that would have protected the sanctuary and provided some desperately needed public green space on the concrete-jungle south coast. The owner of the sanctuary, a wealthy philanthropist named Peter Allard, understandably gave up on Barbados when he found that the new DLP government intends to develop and profit from the Graeme Hall wetlands area just as the last bunch did. After the sanctuary closed we heard a few rumours and even a press release that the government was talking with the sanctuary owner, but like most of the government “initiatives” around this place that turned out to be just so many words. Lots of words and no action. Meanwhile, those 85 jobs are gone and Minister Sealy is running around trying to convince other companies not to fire a dozen here and a dozen there. If any of our readers have heard anything different, please let us know, but we believe that those 85 jobs and one of our premier tourist attractions are gone, gone, gone. BFP – Nov 25, 2008: Save The Graeme Hall Nature Sanctuary Facebook Group Goes International! Nation News – Jan 7, 2009: Sealy: Let’s Get Going!